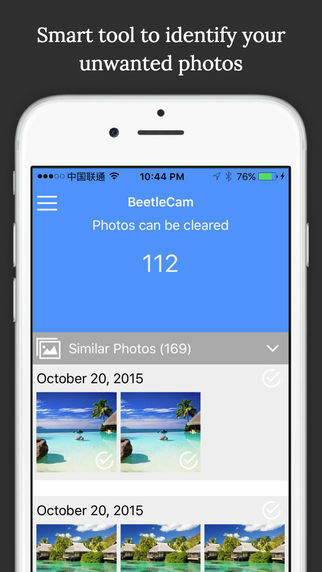 BeetleCam Gallery Cleaner makes it super easy to free up tons of valuable storage in iPhone and iCloud. This smart tool automatically detects unwanted photos in your device. Users using this app have optimized their storage and saved an average of 1.83GB on their devices, give it a try now! This is an ultimate photos cleaning tool that smoothly scans and deletes duplicate or similar photos. 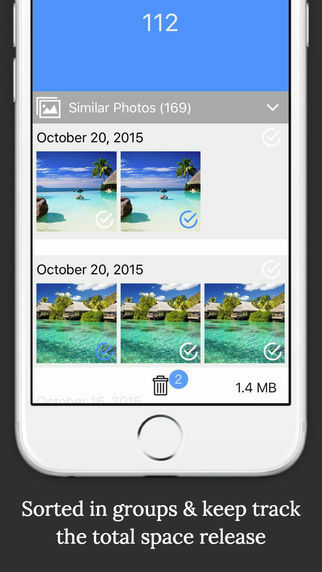 Free up tons of disk space by deleting duplicate photos in just a click! If you have taken photos in burst mode, retouched them, having hugh HDR photos etc, it will find and list them in groups. BeetleCam Gallery Cleaner works like a charm and has the ability to detect similar photos. It helps in situation where you taken photos of the same scene in quick succession to capture the perfect shot, or where you piled up storage by creating backups in the camera roll. BeetleCam Gallery Cleaner is extremely fast when it comes to analysing and comparing a large number of photos within seconds. This is due to the smart algorithms that make the search of similar photos extremely fast, giving excellent comparison results. always keep your phone storage clean.